Wachusett junior running back Cole Durkan (pictured) has formed a lethal 1-2 punch with senior Josh Furtado. The Mountaineers ran the ball effectively in a win over Shepherd Hill Friday, and this duo has rushed for over 500 yards and 9 touchdowns already this season. It was another crazy weekend across Central Massachusetts for high school football. I was at BC High, where Leominster suffered its first loss of the season, but here are my takeaways from all the other action over the past couple of days. Wachusett ultimately came away with the win, but how can you not be impressed by running back Kevin Mensah's season debut? After an injunction cleared him to play Friday, the former Holy Name back exploded for nearly 170 yards and two touchdowns on the ground. But it isn't over for Mensah, as the MIAA is scheduled to hear his eligibility appeal Thursday. At this point, there's no real reason for the MIAA to hold him out- Both Shepherd Hill and Holy Name have signed the transfer waver, and the Rams are 0-3, dashing any "super team" arguments (not that I thought those arguments were particularly convincing or relevant). Even if the MIAA does not grant Mensah eligibility, he is set to appeal in court again on Friday. Honestly, this is just becoming an ordeal for everybody, so I'd love to see the MIAA end it Thursday by granting him full eligibility. With the Rams all but eliminated from playoff contention, let the kid put some good stuff on tape to send to the Division 1 programs recruiting him. 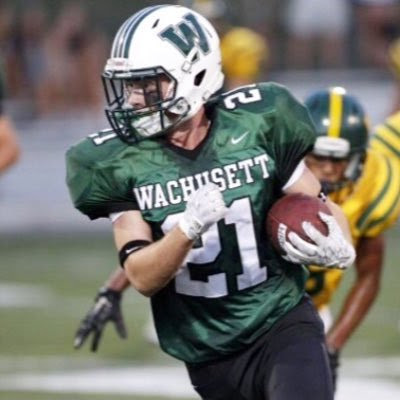 We know Wachusett has had some great teams over the years, and Algonquin has improved tremendously every year under coach Justin McKay, but you still got the feeling that both of these teams were flying under the radar a little bit. With Leominster bringing back Duke commit quarterback Noah Gray, St. John's stacked on defense, and Shepherd Hill getting Mensah in a transfer, it's easy to see why, but that has to end now. The Mountaineers and Tomahawks are the only undefeated teams left in D2 Central after this weekend, and both have beaten some pretty darn good competition. Wachusett topped Shepherd Hill, and the backfield combination of junior Cole Durkan and senior Josh Furtado has been nothing short of spectacular three games in. Algonquin, meanwhile, has done it with defense, holding Nashoba, Marlboro and North Middlesex to just seven points each. It gets no easier for either of them, as Wachusett will head to Doyle Field for Leominster's home opener, while Algonqin will head to Shepherd Hill to face a (potentially) fully-loaded Rams squad. Both these teams are on everybody's radar now. Let's see how they do. No score caught my eye quicker Friday night than Maynard's 20-6 victory over Littleton. Yes, it's a rivalry game, so anything can happen, but I couldn't help but be surprised as the Tigers topped, uh, the other Tigers. Senior running back Alex Longo rushed for 87 yards and a pair of touchdowns, but the defense stole the show. Nate Duplessis returned a fumble seven yards for a score, and the Tigers held Littleton to a season-low 6 points. Defensively, Maynard has shown talent at all levels. Linebacker Eric Kiley has 12 tackles against Littleton, pushing his Central Mass-leading total to 31, while Axum Semakula's seven stops gave him 25 for the year. Two-way senior star P.J. Falzone has been an impact player in the Tiger secondary, picking off four passes in the first three games, while Nick Weber leads the team with two sacks. Despite having less than 30 players on the roster, coach Harold Ogilvie's group flipped the script on a Littleton squad that beat them 24-0 last year. The Mid-Wach leagues get most of the attention, but boy is the top division of the Southern Worcester County League gonna be a barn burner! Grafton has blasted quality opponents the last two weeks, outscoring West Boylston and Oakmont by a combined score of 82-14. Ifeatu Melifonwu has been virtually unstoppable running the ball (14.4 yards per carry), and the Indian line is gelling and starting to run people over. Meanwhile, Auburn's resurgence continued with a 37-14 win over Hudson. The Rockets have scored over 30 points in their first three games, powered by quarterback Steve Saucier's seven combined touchdowns (2 passing, 5 rushing). As far as quarterbacks go, you can't go wrong with long-time Uxbridge starter Max White-Cohen. The senior has already thrown for over 520 yards and eight touchdowns, as the Spartans have scored 107 points in their first three games, all big wins. And don't count out Northbridge. The defending D5 state champs are re-building, but the young Rams are finding themselves, and have gutted out wins over Bartlett and St. Peter-Marian. The best part? None of these teams have played each other yet. But, over the next five weeks, we'll see all of them (except Northbridge and Uxbridge, Turkey Day rivals), face off. Next week Uxbridge will play a big game out of league against Oakmont, while Auburn will play Tantasqua (another solid SWCL A team), before the Rockets and Spartans battle each other on October 8th. Northbridge will take on Holy Name, before facing Grafton and Auburn back-to-back. This race should be awesome to watch. When I think of Quabbin football, I usually think about former quarterback Dylan Kierman throwing it all over the yard, and giving the eventual 2013 D4 state champion Doherty Highlanders an early scare. That kid was a great talent under center (mostly in the shotgun, actually), and it appears the Panthers have found another in junior Ryan Malkowski. Malkowski led Quabbin to shootout win over Worcester North Friday night, tying a school record with six touchdown passes, including the game-winner with less than five seconds to play. On the year, Malkowski is leading Central Mass in completions (38), passing yards (865) and passing touchdowns (12), all in just three games. The Panthers are off to a 2-1 start, scoring an absurd 50 points per game. Over the next few weeks, Quabbin has the chance to pick up some big wins in the race for a playoff spot in Division 3 Central. They'll play at divisional opponent Oakmont in two weeks, and host Hudson the week after that. With Grafton and Auburn pretty much locked into two of those spots in D3, keep an eye on the Panthers as a team that could get in, and cause some problems for the top seeds.